On Wednesday, July 27th Ironman sent out a “Pro Membership Update” email to their professional athletes. (A big thank you to the athletes who forwarded their emails to me or posted it online.) Among a number of smaller changes there are also going to be changes to the Kona Pro Ranking, starting with Kona 2017 qualifying. This post has a closer look at the changes and their implications. The scoring structure will adjust to be calculated using an athletes FOUR (4) highest scoring events. The KPR will be calculated using the Kona Points from no more than two (2) Ironman® 70.3®-Branded Kona-Qualifying Races and no more than three (3) Ironman®-Branded Kona-Qualifying Races. A Pro Athlete’s KPR is calculated using the athlete’s five (5) highest scoring Kona-Qualifying Races. KPRs are calculated using the Kona Points from no more than three (3) Ironman® 70.3®-Branded Kona-Qualifying Races and no more than three (3) Ironman®-Branded Kona-Qualifying Races. Instead of five races only four will be included in the total score. The total score can include only two 70.3 instead of three. The men’s July cutoff would have been at 3.490 points instead of 3.620 points. The only male athlete not qualifying under the new rules would have been Trevor Wurtele, his total would have been reduced from 3.725 to 3.100 as the lowest scoring of his three good 70.3s would have been removed. Instead Bertrand Billard would have qualified, he had only four races in his total which therefore would have been unchanged at 3.490. The female cutoff would have occurred at 4.095 instead of 4.490 points. As on the male side, there would have been one different qualifier: Instead of Alexandra Tondeur with three 70.3s a slot would have gone to Carrie Lester with four scoring races. The cutoff is reduced, but qualifying with only one or two Ironman races is still quite hard. 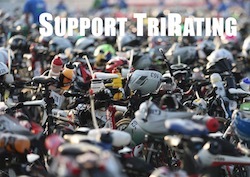 Unless you can score major points in Kona, racing (at least) three Ironman races is still required in order to qualify. Reducing the number of races in the total further increases the reward for racing well and finishing on the podium. The number of points from 70.3 races is reduced, therefore Ironman racing becomes more important for Kona qualifying (as should be the case). In my eyes these rule changes don’t address the main concern about the KPR: Requiring frequent racing on the Ironman distance (especially for the women) tires athletes and increases the risk for injuries, and often athletes can’t show their best races in Kona. Nonetheless, the changes are in the right direction and my overall my assessment of these rule changes is positive.